I bought too many tangerines for making applesauce. I can't possibly eat them all so needed to come up with a recipe or two to help use them. One of my favorite "toys" from a product review a few years ago is the Deni MT149 Meat Tenderizer with 49 stainless steel blades. I had had a fantastic melt-in-your-mouth chicken recipe at my cousin's house and she attributed it to her meat tenderizer so I had to get one an this one is PERFECT. Every piece of meat I have used this on whether it is beef, chicken or pork turns out fork tender and juicy. 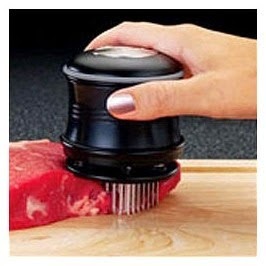 I HIGHLY recommend this meat tenderizer to anyone who cooks! Juice together the lemon and tangerines. Use the meat tenderizer gently on each chicken piece. Place chicken pieces in shallow baking dish. Sprinkle chicken pieces generously with salt and pepper. Pour juice over chicken pieces, turning to coat. Set Aside for 30-45 minutes. In a large skillet cook bacon until crisp. Add onion slices to the bacon grease, sauteing until translucent. Move onions to the edges. Add chicken pieces to the bacon grease, sprinkle with the brown sugar, cover and saute' for 4-5 minutes per side until golden. Plate chicken and immediately top with cheese. Add crumbled bacon to the onions and mix well. 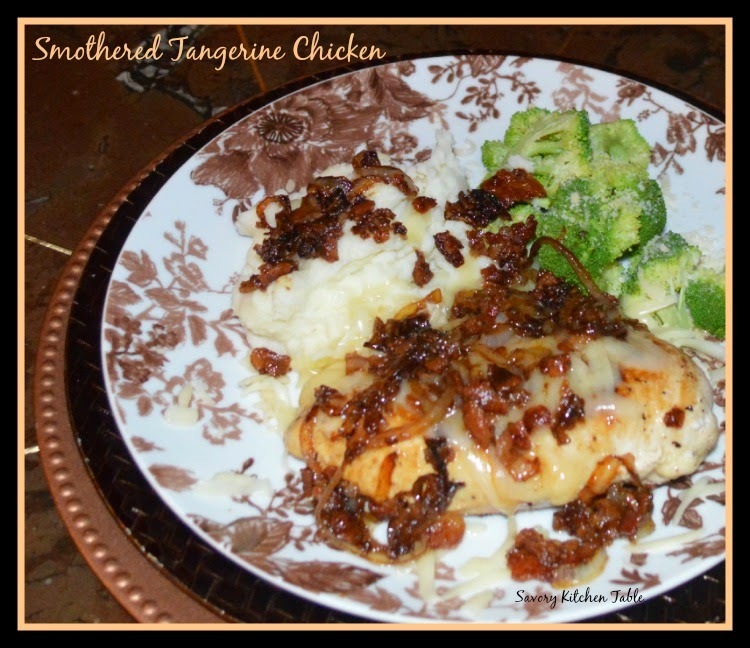 Top chicken with onion bacon mix and ENJOY!